There have been no instances of voter impersonation fraud in Missouri since 2000 (from an investigative news report). Zero. Nada. It’s all about pretending to solve a problem that doesn’t exist as a cover to suppress the vote of qualified voters who tend to support the other party. This week on the House floor we debated Voter ID reform. Currently, Missouri voters are not required to present photo identification in order to vote, leaving ample opportunities for fraud in the election process. HJR 47 would require every voter to submit a photo ID on Election Day. To prevent the disenfranchisement of voters who do not have or cannot afford to obtain photo identification, HB 1073 allows voters to cast provisional ballots and then return to the polls with a photo ID so their vote may be counted. Individuals who do not have proper photo identification will also be provided a free photo ID. Fair and reliable voting is the backbone of democracy and in some counties across the state there are more registered voters than eligible voters. I believe this legislation will help protect Missouri elections and now is the time to reduce voter fraud. Interesting. Representative Hoskins didn’t mention “voter impersonation fraud”. Voter ID wouldn’t in any way address registration fraud or double voting at the polls on Election Day. If you’ve worked a polling place on Election Day you understand the extreme risks someone would have to take to perpetrate voter impersonation fraud. The poll workers are usually from the precinct (your friends and neighbors). They may know the person the hypothetical impersonator would try to impersonate. There may or may not be Poll Watchers or Poll Challengers from the political parties keeping track of voters they’ve identified as part of their get out the vote programs. The person who someone might try to impersonate could have already voted or could be in the immediate vicinity about to vote. The thing is, the hypothetical impersonator wouldn’t have a certainty of knowing. All that risk for one vote? It’s not worth it. However, anything that suppresses the vote of 220,000 qualified Missouri voters that tend to vote for the other party is a good thing in the eyes of the republicans in the General Assembly. Representative Hoskins (r) thinks we’re all too stoopid to understand that. Might be in the 47% and doesn’t yet know it. HB 2045: Can you use your car? To amend chapter 10, RSMo, by adding thereto one new section relating to the designation of the white-tailed deer as the official state game animal. 10.111. The “white-tailed deer” (odocoileus virginianus) is selected for and shall be known as the official game animal of the state of Missouri. And here we all thought it was gonna be squirrel. The car thing would’ve worked there, too. That’s got to be considerably less than the average annual profits from beer consumption by party members, right? Will Missouri jump on the freedom to discriminate train? 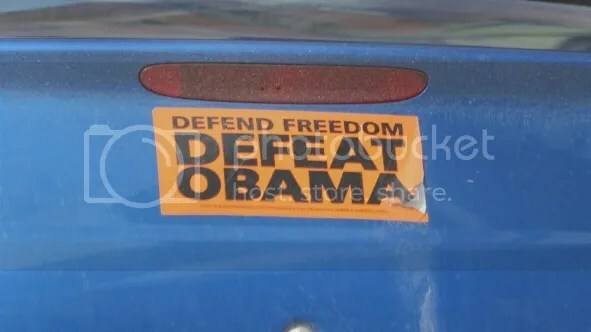 You know how rightwingers like to talk about how everything they do is because of freedom? Freedom from corporate regulations that protect air, water and consumers, freedom from unions and those pesky rights that unions protect, freedom from Obamacare and the healthcare it provides for millions; the list of what these freedom fighters struggle against is almost endless and covers most of the things that guarantee a happy, healthy and prosperous middle class in America. The most recent freedom drumbeating seems to involve the freedom of certain brands of religious folks to discriminate against those who offend them. In the wake of LGBT successes in obtaining marriage rights via state legislatures and in the courts, rightwingers have fought back with bills that would enable businesses to refuse service to folks whose “lifestyles” upset their fundamentalist Christian sensibilities (I add the word “fudamentalist” to make it clear that not all Christians are bigots). If, like me, you’re of a certain age, it makes you think of the bad old days when good, white Christian businessmen refused to serve African-Americans because Jesus wanted the inferior races kept in their place. The bill does indeed specify that it cannot be used to defend against infractions of current civil rights laws. But, while Missouri has enacted employment non-discrimination laws that recognize sexual orientation and hate-crime laws that protect transgender individuals as well, that’s the extent of explicit LGBT protections. It’s hard not to conclude that LGBT individuals in Missouri are absolutely vulnerable to this law – along, potentially, with other unprotected classes of individuals who might cause the sensitive moral antennae of some religious folks to quiver. Given the delicate sensibilities of some conservative Christians, it could get to be quite a free-for-all. The irony is that this bill, which Wallingford admits is modeled on the outrageous freedom to discriminate bill passed by the Arizona legislature, has been taken up here in Missouri just a few days before Governor Jan Brewer saw fit to veto the Arizona bill. As TPM’s Josh Mashall notes, the most recent response to these blatant attempts to institutionalize discrimination has been “an almost comical run for the exits by various supporters and quasi-supporters trying to get out from under legislation that a growing body of people saw as silly, mean-spirited, economically damaging and completely needless.” But not Missouri, no sir, we work hard to earn our backwardness label. Quotes added in 2nd paragraph. Fourth paragraph edited slightly for clarity. Rex Sinquefield finally got some company. StudentsFirst is Michelle Rhee‘s organization. Teachgreat doesn’t quite cut it. Add a PAC on teaching and Rex Sinquefield’s money and what you get is just another astroturf organization dedicated to trashing K-12 public education. 26th Senate District: As if there’s any difference? It appears that Senator Brian Nieves (r) has drawn a primary. At 4:03 p.m. yesterday Representative Dave Schatz (r), who was first elected in the 61st Legislative District in 2010 (and not yet subject to term limits), filed as a candidate in the 26th Senate District, challenging Senator Nieves (r) in the primary. Gee, this stuff looks familiar. As if there’s any substantive difference between the two? A Missouri state senator is sponsoring one of those vile, hateful “religious liberty” bigotry bills that would codify in law second class citizen status for gay and lesbian Missourians and allow every inbred Ozark goober who “hates fags” to refuse to sell gasoline to the driver of a car sporting a rainbow flag – or a Darwin fish – because they’re good Christians and they’re confident that Jesus would discriminate against those degenerates, too. The legislation, sponsored by Sen. Wayne Wallingford of Cape Girardeau, states that a governmental authority shall not substantially burden a person’s free exercise of religion unless the government demonstrates that it has a compelling interest. To supporters of the idea – similar to legislation filed in several other states – the goal is to make it clear that private individuals can use religious beliefs as a defense in litigation. “We’re trying to protect Missourians from attacks on their religious freedom,” Wallingford said. Opponents contend bills like Wallingford’s would allow businesses to discriminate against anyone they do not like, most notably gays and lesbians. “It’s a legislative attempt to legalize discrimination toward (lesbian, gay, bisexual and transgender) individuals,” said A.J. Bockelman, executive director of the LGBT rights organization PROMO. Wallingford said he based the bill loosely on legislation that has been debated in other states, such as Kansas and Arizona. He pointed to instances that have cropped up in debate in those other states. When I saw the article on the Kansas City Star site yesterday, I first hit the ceiling, then I got dangerous – that’s what my husband calls it when I get quiet and methodical – I put my “journalist” hat on and called his office (that number is 573-751-2459 if you want to call him) and I got his office voice mail. I identified myself by name and press affiliation as well as my phone number, and said I just had one question: If he was personally financially responsible for defending this blatantly unconstitutional violation of the Establishment Clause in the courts, instead of the bill falling to the taxpayers of this state, would he still be sponsoring it? I then repeated my name and affiliation and phone number, and asked for someone to please call me back. Quelle surprise…no one did. 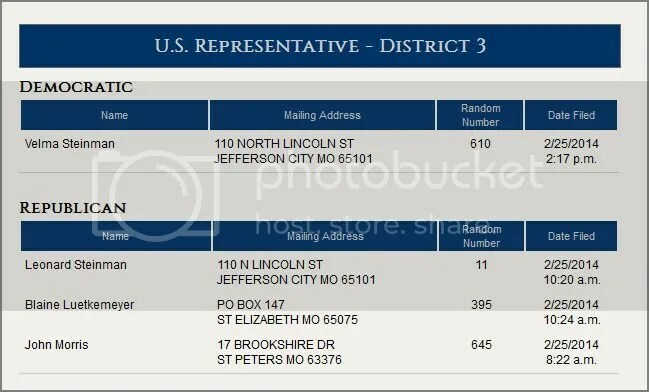 First day of candidate filing summary from the Missouri Secretary of State. You think those party ratios in the General Assembly are an indication of the power of incumbency? Just asking. If you do run you may lose. If you don’t file you can’t win. If no Democrats files in a district who will Democrats vote for? Just asking. Remain calm, don’t hyperventilate yet. Candidate filing is open until March 25, 2014. What are the odds of an “All in the Family” general election race? It would have been cute if they had waited in line together. Or, could this be an indication of something? Just asking. Read 1st time February 24, 2014, and ordered printed. To repeal sections 1.302 and 1.307, RSMo, and to enact in lieu thereof one new section relating to the exercise of religion. (3) “Relevant circumstances”, includes legitimate penological interests needed to protect the safety and security of incarcerated persons and correctional facilities, but shall not include reasonable requests by incarcerated individuals for the opportunity to pray, reasonable access to clergy, use of religious materials that are not violent or profane, and reasonable dietary requests. 2. A governmental authority shall not substantially burden a person’s free exercise of religion, even if the burden results from a rule of general applicability, unless the governmental authority demonstrates that the burden on the person is essential to further a compelling governmental interest, and the burden is the least restrictive means to further that compelling interest, considering the relevant circumstances. 3. This section provides a claim or defense for state and local laws, resolutions and ordinances, and executive orders, and the implementation of such laws, resolutions, ordinances, and executive orders, whether statutory or otherwise, and whether adopted before or after August 28, 2014, which violate the free exercise of religion established pursuant to this section. 4. This section shall apply without regard to whether a state or local governmental authority is a party to the claim, proceeding, or other legal dispute. (3) To allow any person to cause physical injury to another person, to possess a weapon otherwise prohibited by law, to fail to provide monetary support for a child or to fail to provide health care for a child suffering from a life-threatening condition. It’d be nice if there was an amendment which required businesses to disclose if they subscribed to and applied this if it becomes law. That way I’d know to take my business elsewhere. In case you were wondering, LGBT individuals, their allies, their friends, and their families do spend money.